On another trip to the dentists and East Cowes, while waiting for my Husband to have his treatment I popped into Waitrose just to have a general look around. 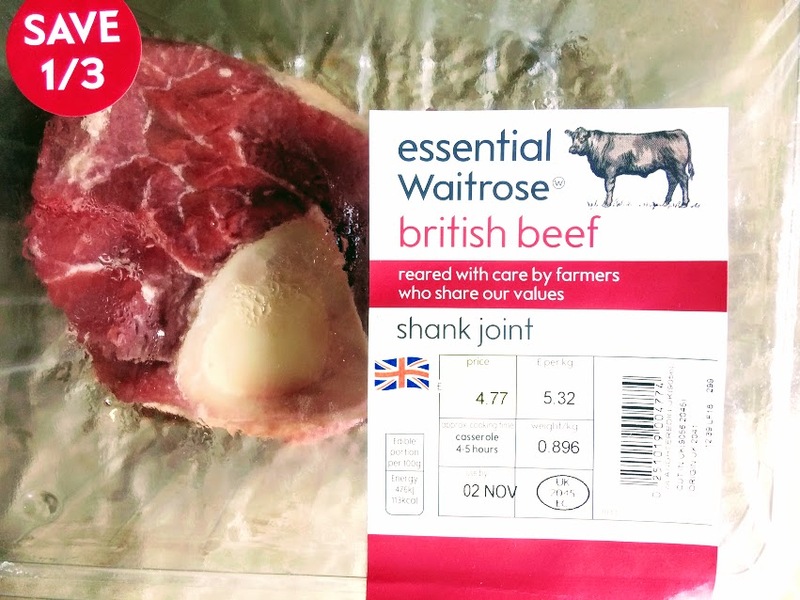 In the meat section, I saw beef shanks for sale. I’ve never seen these for sale before in a supermarket neither had seen any recipes in cookbooks or on TV. 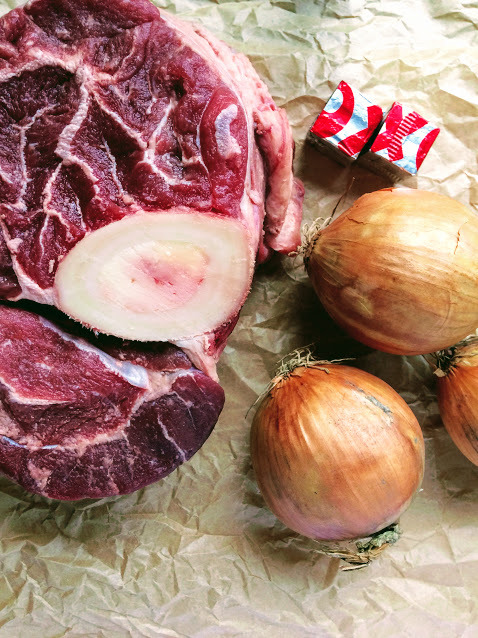 Anyway I bought a couple of kilos of the beef shanks. They were on sale for £5.32 per kilo, which was a good price. I figured they were the type of meat that needed long slow braising. Once I got home I did a bit of research and sure enough this meat cut is from the top of the leg of as needs a good 5 hours of braising to make it tender. 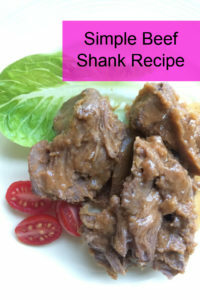 Here is my easy braised beef shank recipe. 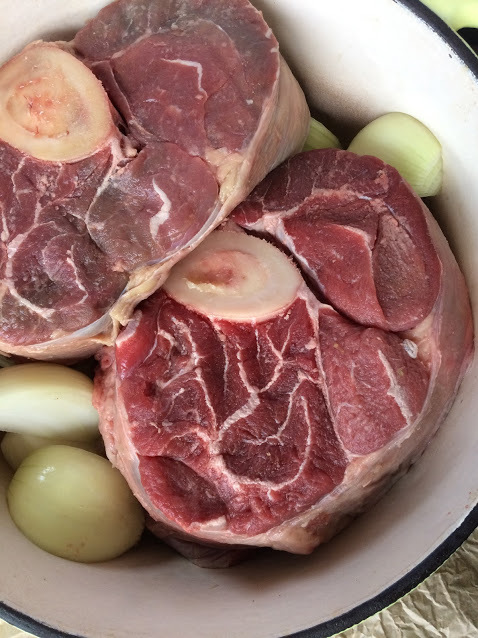 I used my enamelled cast iron casserole pot, and I placed the beef and the onions in on one layer on the bottom of the pot. I then poured over the bone broth and OXO liquid until the meat was just covered. If you don’t have any homemade bone broth to hand just substitute this with 600ml of water and 3 OXO cubes. The casserole was placed into the oven cold at 140C for 5 – 6 hours (if your oven allows it I would try 120C but 140C is the lowest my oven will go). The recipe is done once the meat falls apart easily when you use a fork to separate the fibres. You could eat this right away, however, like most braised dishes this dish will only improve if you allow it to cool and reheat the next day. Another advantage of placing the dish into the oven is the layer of fat that solidifies on top this is easily removed when cold. 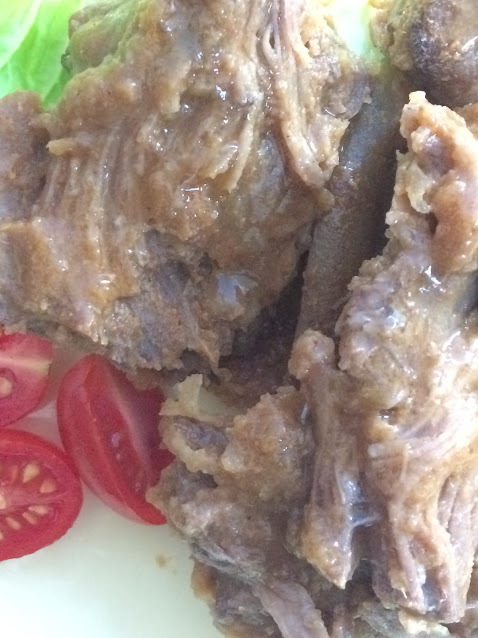 Although a layer of fat did appear on the surface of this dish the layer was not that thick. Clearly, beef shanks are not a particularly fatty cut of beef. Large chunks of root vegetables could be added to this dish at the start of cooking for example carrots or swede.